According to the reports, Farah had crashed her car, and was using SRK’s spare to get around, before King Khan gifted her a new set of wheels. Mercedes-Benz GL-Class was launched in India for a price tag of Rs 77.5 lakhs, ex-showroom New Delhi, in presence of Boris Becker. The GL SUV of Merc dwells a 3.0L V6 diesel engine of 260 PS @3600 rpm and 619 Nm of torque at 1600-2400 rpm. The gas guzzling SUV gets its power delivered to all the 4-wheels via 4MATIC all wheel drive system using a 7G-TRONIC automatic transmission. The superstar has gifted Farah cars in the past too – a Hyundai Terracan when she completed her directorial debut Main Hoon Na. In return, Farah too gifted the King of Bollywood a Mercedes-Benz S350 after Om Shanti Om wrapped up. SRK had gifted a lot of pricey gifts to other stars of industry. On a side note, why can’t we all have expensive car gifting friends like SRK? 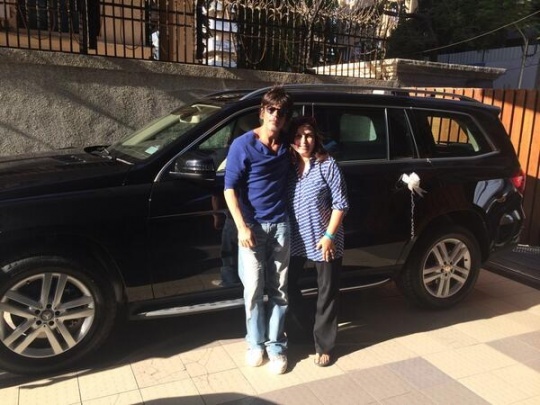 Let us know what you think of Shah Rukh’s surprise for Farah – meant a big Mercedes GL!